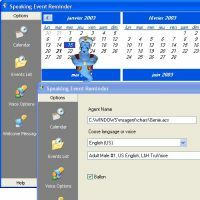 On the calendar panel, you have a global view of the events. The event days are shown by bold dates. 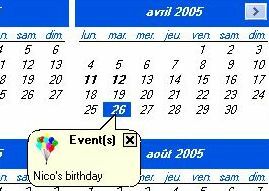 A left click on it will show you the event(s) of the day (see screenshot). A right click allow you to Add/Edit or remove event of list directly from this panel. In the Event list panel, sort events depending, name date or event by a left click on column header. You can add/edit or remove events from the event list from this panel too. You can specify the sentence too say for remaining days using variables _n_days (which is the number of remaining days) and _event (which is the event name). 1)"_n_days days before _event" will be read as "4 days before mam's birthday" if it remains 4 days before event and the event name is "mam's birthday"
You can specify too if a sentence will be read if there's no event in the following days. 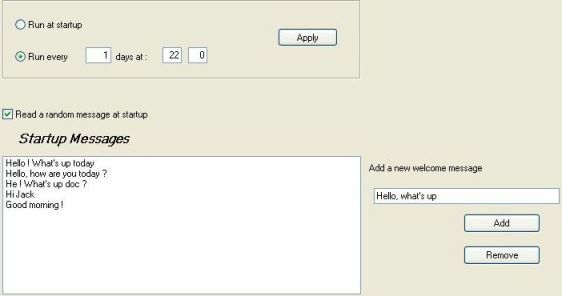 Just check the correponding option and enter the sentence to say. To validate your changes just push the "Apply button"
- As a schelduled task. It allow you to specify hour and day interval for application startup. 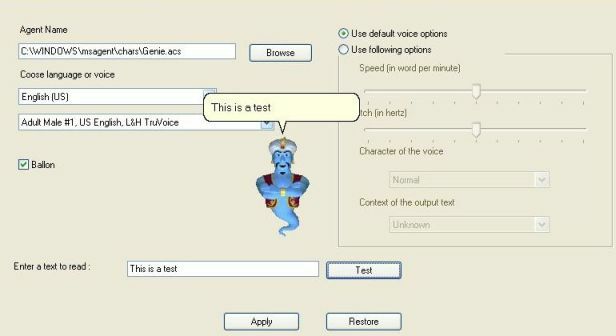 You can check language configuration by making agent reading a test sentence. Until you haven't click the "Apply" button, you can restore your previous configuration using the "Restore" button.